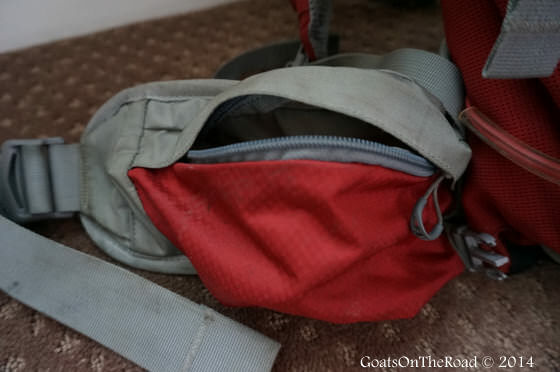 It’s time to review my current backpack, the Osprey Kestrel 32. Having a backpack that fits properly and is geared towards the activities you’ll be doing are very important qualities in a backpack. 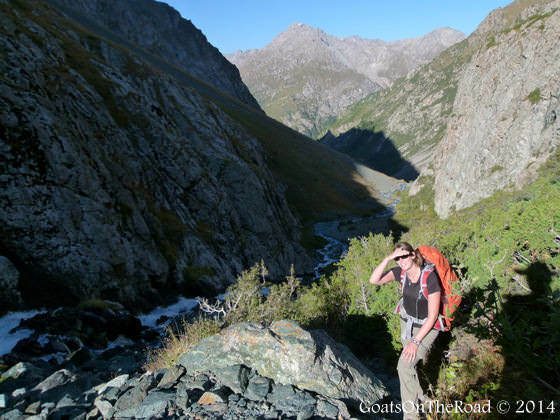 I took this pack on many hikes and treks during our very outdoorsy trip through Mongolia, Central Asia and the ‘Stans and I was very impressed with it. This backpack deserves high marks in this area. 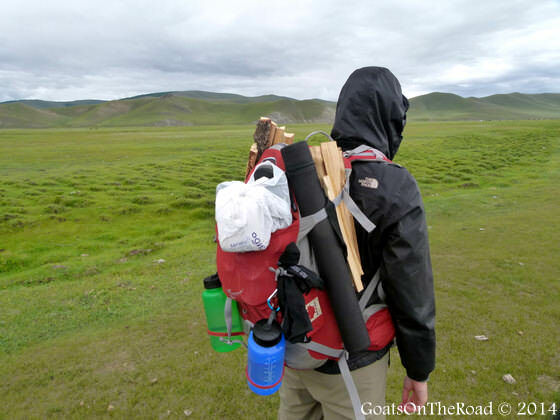 I stuffed this bag with 10kgs of gear while trekking through the Mongolian steppe for 8 days, carrying everything from food to fire wood to sleeping bags. This pack sat nice and snug on my hips and perfectly distributed the weight between my shoulders and my waist. There is a good amount of padding on both the shoulder and hip straps as well. This was an extra heavy load I was carrying – water bottles, food, wood, fishing rod, sleeping bags, etc. But it was comfortable. During a regular travel day, I barely even noticed I was wearing a backpack because it was so comfortable. I absolutely love the way the Kestrel 32 is designed. I can’t stand top-loading backpacks because you can never seen what’s in the bag! 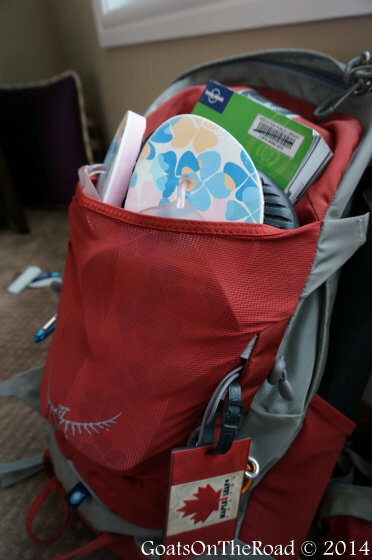 This backpack is a panel loader, which means it opens like a sea shell, allowing you to easily and quickly see everything in your bag, and load it up faster. I love how the bag opens! There harness adjusts as well, using a really strong Velcro, to ensure the perfect fit. They’ve also added a back panel that allows air to escape from your body, which is perfect for when you’re trekking, hiking or even just walking. There’s nothing worse than having sweat dripping down your back while travelling! At the back is a pocket perfect for a hydration system like a CamelBak. The weight and size of this backpack is amazing. Weighing in at just a little over 2 lbs with 32 L of room for gear and able to handle up to approximately 20 kgs of weight, what more could you want?! The Kestrel 32 comes in two different sizes: small/medium and medium/large. As well as 4 different colours: Fire Red, Tarn, Conifer Green and Grey. Osprey has added a mesh, stretchy, lycra pocket to the front of the bag, which stretches like you wouldn’t believe! I put my shoes in there, maps, food and anything else that wouldn’t quite fit into my bag. On the side, there are also 2 of the same type of pockets that are perfect for water bottles, or in our case, the bottom end of Nick’s fishing rod. On the waist band, there is a little zip pocket on each side. They’re the perfect size for putting things you’ll need to have easy access to while you’re on the move, ie: point and shoot camera, lip balm, iPhone, snacks, a lighter, medicine, etc. 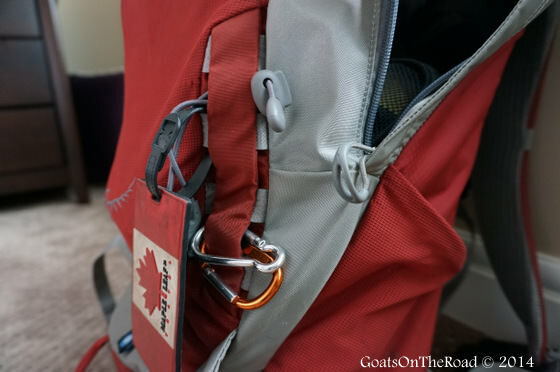 Running alongside the mesh pocket on the front of the bag they’ve added something called “front daisies” which are these perfect little loops that you can hook carabiners onto. I hooked water bottles off of the front of my bag, and sometimes shoes. It was ideal. 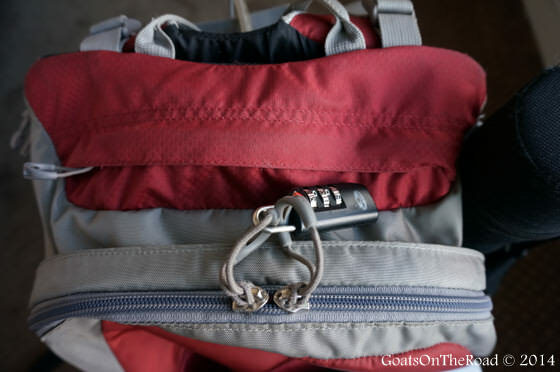 There’s a spot right near the waist belt for storing trekking poles while on the go. My favourite feature is probably the compression straps on both sides of the backpack. 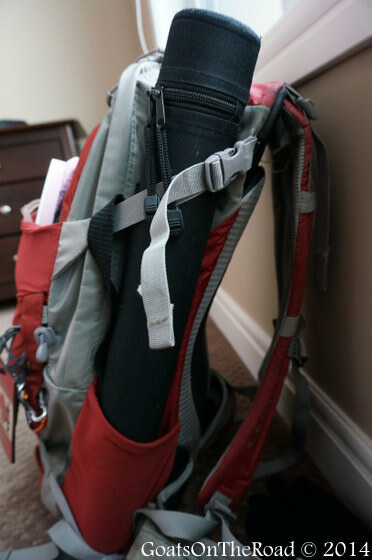 Not only does it help to keep the pack snug against your body, but it allows for storing items on the sides of your bag. One one side I had Nick’s fishing rod, and on the other side, I rolled up my jacket and strapped it in. If you were doing any sort of climbing where ice was involved, there are ice-pick loops at the base of the backpack. However, I used the loops to secure the bottoms of my 1 liter water bottles. The mesh, zip pocket at the top of the bag is a great place to put smaller items that you don’t want getting lost in the main compartment, ie: cards, headlamp, jewellery, etc. In my opinion, there are 3 cons to this backpack. The first and most important is that the zippers can’t be locked together. You can only lock together the zipper ties. Which is ridiculous because obviously every traveller wants to be able to properly lock their bag. The second is that I would have liked to have another pocket or two inside of the backpack for small items. The one on top of the bag is handy, but it would be nice to have one or two that are concealed inside the bag. The third con is that unlike the Osprey Farpoint Series, the harness unit can’t be zipped away in order to protect the backpack straps from damage, either from getting caught on something or from airline staff being a little too rough with the bag. Apart from that, everything is a “pro”. I would recommend this backpack to anyone. Even though the Kestrel series is technically a men’s backpack, it worked for me. Because I’m tall (5’10”), the harness adjusted to fit my torso perfectly! 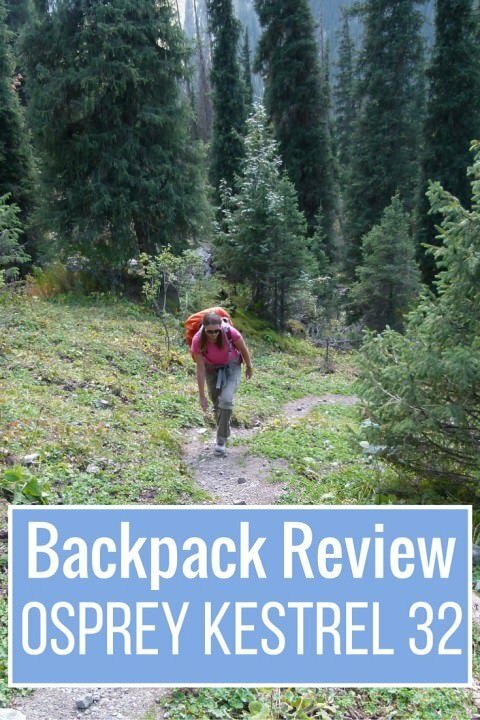 If you plan to do any sort of climbing, trekking, camping or hiking, this backpack is ideal. If you don’t plan on doing any sort of outdoor activities, I still think this backpack has loads of features that the everyday traveller could use as well. 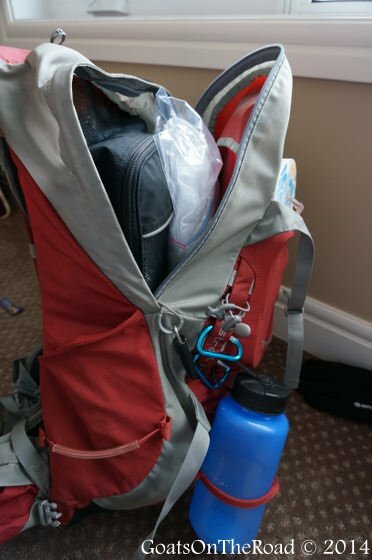 The Osprey Kestrel 32 was the perfect bag for trekking! A huge bonus is it’s size. Technically, it’s small enough to fit as a carry-on bag when flying. The cost is also pretty decent: I got mine on sale online for about $90, but from the store it’s usually about $130. It’s time everyone became a lightweight traveller. Downsize your backpack and buy the Osprey Kestrel 32, it’s the perfect size for any adventure. Hopefully this review helped. Good luck finding the perfect backpack for you. What kind of backpack do you use? Would you recommend it? Why/why not? Share with us below! Nice and comprehensive review, Dariece! 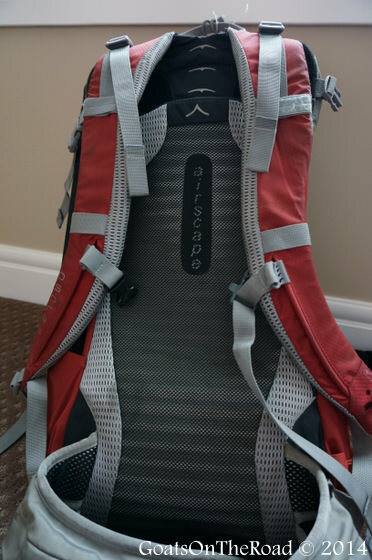 Zab has an Osprey Farpoint 40L and loves it, especially the zipping away of the straps! I would certainly go for something a bit smaller, as I wouldn’t want 40L of crap to carry…so I like you have a 32L, though by Deuter, which I also find pretty good. Love that you guys carry such small bags! Lightweight travel is the way to go these days for sure 🙂 That’s a great feature of the Osprey 40L that the straps zip away, definitely a con of the 32L. Thanks for following up the first post on these packs when you brought them. I loved that one and this one is a great round up of features etc. I am having to get a backpack for India later this year so from your comments the Osprey will certainly be looked into. Excellent. I think it would be a great bag for India, just the right size. The only issue (like I said) is that the zippers don’t lock together and I usually like to do that in India when on trains and such. But I’m sure it would be fine and you would figure out another way to secure your bag. Did you use Small/Medium or Medium/Large? Ya, that´s something to think about for sure. I do find that in hotter climates I sweat, but not to the point that it´s a problem, and I do find it airy enough. Doing EBC, it won´t be super hot and you´ll probably be wearing some sort of jacket so you won´t sweat directly onto the pack…? Hard to say really, depends on how much you perspire! I personally love it. Any zipper can be opened very easily even if you lock tabs together. Just insert a pen or a pencil between the teeth of the zipper an push, now to close it and leave no traces of it being open just move tabs that are connected together from one side of the zipper to another. Thats it. Every bagage handler know this. Pont is, there is no way to secure a bag with zipper, so its not really a disadvantage that you cant lock it up. Enhigltening the world, one helpful article at a time.